1. Choose the product, quality and delivery time in our online shop. 2. 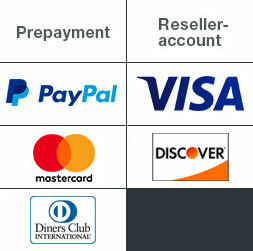 After selecting any additional options and the payment method, a field for entering a voucher code appears. 3. Enter your voucher code and click “verify”. The amount of the voucher is then automatically deducted from the sum due. Each voucher code may only be used once. In addition, some voucher codes are valid for first-time customers only. If you have any problems redeeming your voucher code online, please contact our customer service centre; our team will be happy to assist you.